Missing out on this deal will quite possibly ruin your Memorial Day weekend, and the bad news is that most of you are going to miss out on this deal. Why? 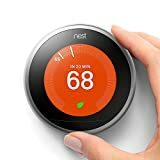 Because Amazon is selling the 3rd-generation Nest Learning Thermostat right now for just $149.99! That’s the lowest price ever by a huge margin, but there’s a very limited quantity available at that price. Other sellers are also offering pretty deep discounts though, so you can still save a bunch of money even if you miss it at the $149.99 price point.